Where was this one supposed to be then? I suppose I asked for that. Whereabouts? I can see I'm going to have to take this one slowly. From the north side of the city to the south. Ok, ok, ok. Quit it. Coventry is the location of possibly the greatest Inner Ring Road in the country. Or maybe the scariest. Or maybe both! It's even better than the one that used to exist in that other large Warwickshire city, Birmingham. To a certain extent, it was easy to be a planner in Coventry in the 1950s and 60s. The city suffered greatly from bombing during World War II, with pretty much the entire city centre (including the famous cathedral) being flattened. So, lots of sharpened pencils were required, and the planners got started on plenty of ugly concrete shopping and commercial areas, a new cathedral and the Inner Ring Road. As you might expect, Coventry city centre has spent the last twenty years or so desperately getting rid of as much ugly concrete as possible and making itself look a lot nicer (which, to be fair, they're managing to do slowly), but not for nothing did some wag declare: "Coventry. Hmm, architecture by Luftwaffe". So, we're now in the mid 1960s. Construction on the Inner Ring Road has been started, and it's got most of the way around, with the last couple of stages programmed in to be finished by the early 1970s. The city centre reconstruction is pretty much done, and people in the planning department at the city council are looking around themselves nervously, wondering what's going to happen when there isn't lots more pencil sharpening to be done. However, there was A Plan. Just like Birmingham, Coventry wanted decent access from the national motorway network when it finally arrived - best achieved by having a little motorway of its own. Whilst Birmingham's example (the A38(M) Aston Expressway) is there in all its tidal-flow glory, there's no such blue line in Coventry. But there should have been - and most of it has a road along the route today, though downgraded massively over the years, and with a gap in the middle. 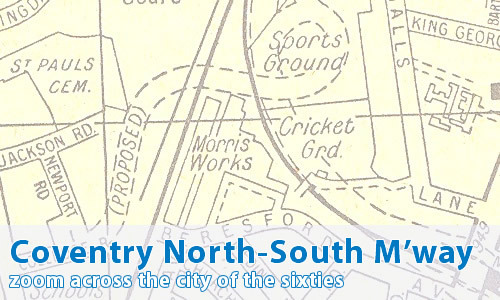 If you've got access to a map of Coventry, you'll see that they describe a line that starts at the M6 end of the city, and ends up on the A45 bypass to the south. Wait a second! That sounds remarkably like the A444 Phoenix Way! Well, it should do. After the new West Midlands Metropolitan County Council got their hands on Coventry in 1974, the road was progressively downgraded. First went the motorway status, and the road ended up with a messy proposed numbering scheme of A444-B4109-A414-A423. The A414 in the documentation is probably a typo for A4114, given that the real A414 runs through Hertfordshire and Essex! Then the fancy flyovers and underpasses (including the one at M6 junction 3) disappeared, and finally we ended up with the road we see on the maps today. Except, of course, for the fact that Phoenix Way still isn't finished! There's a nasty gap on the eastern side of the city, and the road picks up again for the run south out of the city and dumps us on the really rather large A46 towards Warwick. The point we lose the road is just where the planned motorway spur from the North-South Motorway to the Inner Ring Road was supposed to be. Not surprisingly, it has also ended up as a far smaller and less impressive road, A4600/A428 Sky Blue Way. That leads straight to junction 3 of the Inner Ring Road - which will be the really impressive-looking proper free-flowing junction that smashes straight into a roundabout, which simply shouldn't have been there! Yes, you can, though there's an added bonus with this one. Indeed, there's another unbuilt motorway on it - one that's almost ethereal. It went by the title of "Coventry East-West Motorway", and would have linked the North-South Motorway to the north of Stoke Heath with the A45 Coventry Bypass at the B4101 junction near Canley. Only one small part ever got near being built (and then only as a massively downgraded standard), and there's no evidence that I'm aware of "on the ground" that this was ever planned.